Galactic federation investigator Birdy has finally found the villain Geega hiding on Earth. When Geega and Birdy clash in an abandoned warehouse, a high school student named Senkawa gets caught in the battle, and is accidentally killed by Birdy. The only way to save him is for Birdy and Senkawa to share Birdy's body, while Senkawa's original body is sent to the Federation's headquarters for repair. But as they try to balance out Senkawa's school and social life with Birdy's continuing investigation, a sinister plot by rogue aliens and power brokers in the entertainment industry is uncovered. It should come as a surprise to exactly no one that as anime grows older, studios are rebooting older properties for a new generation of otaku. Astro Boy was remade in 2003, Slayers surprised everyone by receiving another season, the seinen classic Golgo 13 has a new anime out, and even a few series I've never heard of are seeing new seasons and adaptations, like To Terra and Cobra. Cynics will say that this must mean there is a dearth of creativity among the studios; after all, why else would anyone do a remake of something that was probably already good the first time around? There are actually plenty of valid reasons for a studio to opt to remake or expand on an existing property, though I won't talk about them here. 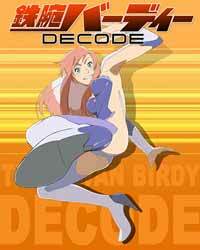 But Birdy: the Mighty Decode has an interesting backstory, because yes, it is a reboot of an older OVA and manga. The original manga was created by Masame Yuki, who is mostly known for Patlabor. Birdy was Yuki's debut work, and because of a combination of Patlabor being very sucessful and a sense of dissatisfaction with how the manga was developing, he abandoned Birdy. The manga was picked up for animation anyway by Madhouse, and was directed by Yoshiaki Kawajira of Ninja Scroll fame. You can tell the original OVA has a pretty hefty pedigree, even though this was an early work for both Kawajira and Masame. Central Park Media released it on VHS and DVD, and despite the obvious appeal of the story and the people who worked on it, nobody remembers the OVA fifteen years later. Even Justin Sevakis hasn't even covered it in Buried Treasure (yet?). Most people seem to remember seeing it on video store shelves but never picking up a copy. Well, "most people," this is your chance to get to know Birdy. Decode is a fine anime with the rare quality of appealing to both the old school fans who remember the days of the OVA, and new fans who can't imagine otakudom without the Internet. Masume Yuki has gone back to his manga and reworked the story and characters and this reboot was personally picked by Kazuki Akane (Noein, Vision of Escaflowne) as his next project. It's basically a remake based on a reboot, and because of that, it's an appealing blend of 80's science-fiction tropes and more modern conventions. In thirteen episodes, you've got gender-switching, science-fiction soap opera, espionage, femme fatale, mystery and even a little bit of romance. While the plotting, pacing, animation and characters are all solid, there are a couple of aspects of this anime that really sold me on it. In the original OVA, Senkawa had an arbitrary love interest that really doesn't go anywhere. In the series, though, it's a sweet subplot tinged with a bit of tragedy. Nakasugi is a charming but sickly girl Senkawa had always admired from a distance, but could never get up the courage to ask her out. Then suddenly, Nakasugi changes; she gets a social life, starts making friends, and even walks to and from school. She starts dating Senakawa, much to Birdy's chagrin, who she doesn't appreciate being dragged along on "human mating rituals." But where did Nakasugi get this sudden energy from? The answer is a great twist that I probably should have seen coming, but was surprised by it anyway. Senkawa and Birdy are also simply better characters than they were in the OVA. Senkawa is a open, likeable student with the odd but fascinating hobby of spelunking abadoned buildings. (An interesting note: in the OVA, Birdy and Geega would have a showdown in buildings that are under construction. In the television series, they fight in large, abadoned warehouses. Maybe I'm reading too much into this, but there might be a theme here about how much Japan has fallen economically in the last twenty years.) He's simply more amiable and likeable than his OVA counterpart. Birdy gets an even bigger boost. It's easy for any schmuck with a typewriter to make someone likeable simply by virtue of how badass they are. The original OVA may have depended a little too much on that, so this time around, Birdy comes to Earth with an android named Tute who is her friend and mentor. He does a lot to humanize someone who can hit something so hard, sparks fly from her fists. Together, Birdy and Senkawa make a great foil for each other. Birdy is a type A, get 'er done kind of girl, who doesn't being dragged into mundane human affairs while, you know, the existence of planet earth is at stake. Of course, she also has a mysterious past, and gets in trouble with the Federation brass because she's a maverick. Senkawa justs wants to live a normal life, hang out with his friends, and maybe date the girl of his dreams. He understands the fate of humanity is staked on Birdy's investigation, but he'd really appreciate it if Birdy wouldn't switch his body without warning in front of his friends. My one caveat is that while the build-up to the ending is great, the final two episodes are a bit of a let down. In a way, it suffers from the same problem a lot of mystery novels have: the suspense and the buildup is bigger and more exciting than the actual ending. Hopefully the second season, which is airing right now, will make up for that. Recommended Audience: Teenagers and up for violence and fanservice. As you can tell by the cover, Birdy usually wears a skin tight uniform, and is also a part-time model. It's not very gratuitous, though, and shouldn't bother most anime fans.